YANGON — One person died and seven were reported missing after a mudslide at a Myanmar refugee camp in Thailand’s Mae Hong Son Province on Sunday night, the Karen Refugee Committee (KRC) confirmed to The Irrawaddy. 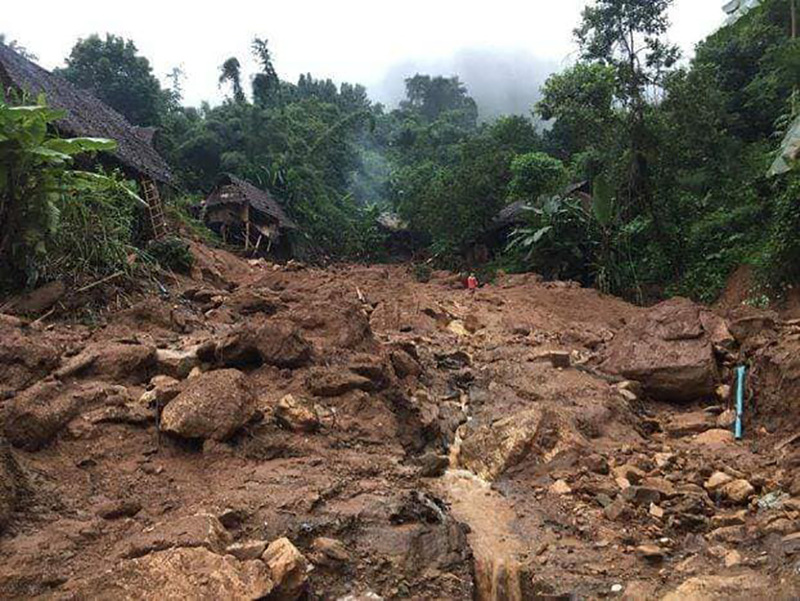 The torrent of earth and rocks, caused by heavy rain, poured down the hill and into the refugee camp around 6:30 pm in Mae La Oon in Mae Sariang, near the Thailand-Myanmar border. “It rained heavily yesterday. That creek usually dries up in summer. So, no one was aware [of the swollen creek] when it rained. Then the torrent came down and eight people were swept away. We’ve only found one body,” KRC chairman Saw Robert Htwe told The Irrawaddy on Monday. The Bangkok Post, citing a report by the provincial governor, said the fatality was a 2-year-old girl. The mudslide destroyed 13 houses in the refugee camp and also injured 16 people. Thirteen of them are still in treatment, Saw Robert Htwe said. “Some were swept away along with their houses. Authorities and non-governmental organizations are carrying out rescue operations,” Saw Pwe, who lives in Mae Sariang, told The Irrawaddy. The mudslide is the worst to hit Mae La Oon refugee camp, he said. The refugee camp, opened in 2004, currently houses some 10,000 displaced people from Myanmar, most of them ethnic Karen, displaced by the fighting between the Myanmar Army and the Karen National Union (KNU) in Karen State.